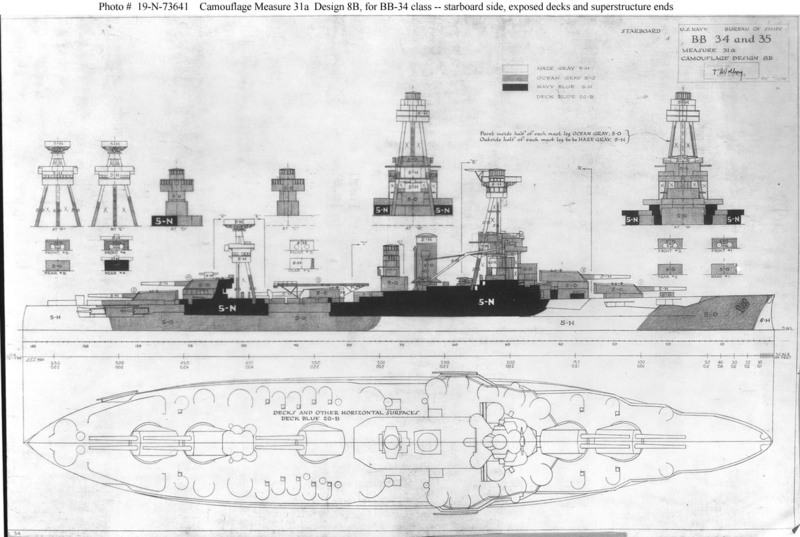 Drawing prepared by the Bureau of Ships for a camouflage scheme intended for the battleships New York (BB-34) and Texas (BB-35. This plan, approved by Captain Torvald A. Solberg, USN, is dated 11 October 1944. It shows the ship's starboard side, exposed decks and superstructure ends. New York wore this pattern in late 1944 and early 1945. Texas was painted in it for a brief period during the final part of 1944. Photograph from the Bureau of Ships Collection in the U.S. National Archives. If you want higher resolution reproductions than this digital image, see: "How to Obtain Photographic Reproductions."